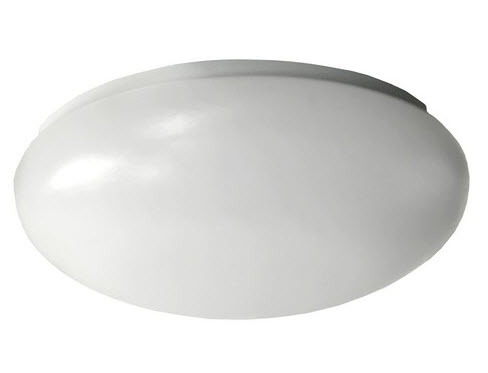 Morris LED cloud light fixture with 17 watts for many types of security and general lighting needs. Pure white light in an energy saving LED array. The white translucent lens covering distributes the light evenly in every direction while providing a certain amount of visual comfort, reducing glare. It's popular for many areas that need a clean looking bright light. - Choice of 3000K or 4000K light color. At BuyLightFixtures.com, we want you to have the best quality light fixtures for any commercial office or home decor possible. That’s why we carry many types of drop LED cloud lights such as you to see here that are made in the USA. The build quality is better than the imports, and we have a price that’s very competitive with all of those. There’s never been a better time to upgrade your lighting to something that is not only going to give you excellent illumination but also going to provide you with the least amount of energy use possible. Let's face it, saving money is excellent. One of the primary considerations in new lighting is energy savings and how much you can save in real dollars having a good payback for your investment. There’s never been a better time to consider going to something that’s more energy-efficient such as LED cloud lights. If you’re unsure as to how much money you can save, we have a simple lighting payback spreadsheet that you can download from the left-hand column of our website. It gives you everything you need to compare an existing lighting system to one of our more efficient cloud lighting. All you have to do is input your current data for the troffer fixtures you may have now, comparing them to the new system with less wattage draw. Not only do we have a figure in there for energy savings but it will also calculate the payback, the time it takes to recoup your investment through energy savings. There’s also a figure that you can use for maintenance savings; all this put together can get you a swift payback. And if your electric utility has incentive programs for people upgrading their lighting with something more energy-efficient, you can see that go down even further. The return on investment on energy-efficient lighting is excellent these days, and it’s something to consider to reduce the cost of running your business or office. Now that we talked about energy efficiency, it’s time to talk about proper lighting. We often say that if you save all the energy in the world, but the lighting job turns out to be poorly done, you haven’t saved anything. Whatever you saved in energy you may lose in productivity or sales if it’s a retail situation. So it’s important to get this done right the first time. We want you to have good lighting while you’re saving a lot of energy. That’s the primary goal, and that’s what it’s all about. If you’re unsure about how many light fixtures you’ll need to get a good lighting job done, you can give us some of the information about the room or rooms you’re trying to light, and we can do a sample layout that will provide you with the necessary lighting for your situation. It’s an excellent way to make sure that what you’re doing is going to fit the task that you’re doing underneath the light as well as the general effect that it will have on the space. But will need some of those details from you which have to do with the dimensions of the room, how high the ceiling is, and what you’ll be doing. Another consideration that people need to take into account when changing over to new cloud shape lights is color temperature. Sometimes people think it’s not that important then they will say that you can give me whatever you feel is best, but we don’t like to do that. It’s an individual choice whether you want something that’s going to have a warmer color appearance or something that’s going to be a cooler color. And a personal preference can reflect on how well office functions. You want to make sure that people are pleased with the color of light if you don’t have that you’ll get people grumbling and may be using it as an excuse for not getting things done. Typically the warmer color is something around 3000K; cool white is about 4100K and daylight is 5000K. Most people that use these in a home might be looking at something that would be the warm white color temperature because it works so well with different kinds of lighting applications. A lot of businesses though prefer the 5000K daylight color because it’s so good with black and white contrast, reading and visual acuity. These are all things that will help people be more productive, and that will assist in making that happen. Choose from different types of LED. Call us or email if you have any questions about LED cloud lights or anything else you see on our website. We want to help you get the best lighting possible, and we have many years of reliable expertise in working with commercial and industrial customers, retail, home users, electricians, and general contractors.